Jiankou Great Wall is a wild Great Wall which is not rebuilt and run by the government as a tourist sight. This sections of the Great Wall means the wall around the Xizhazi village. 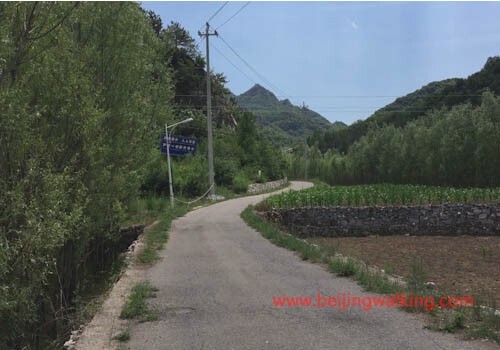 This village is located 38kms northwest of Huairou district (100kms away from downtown Beijing). It is a super beautiful village! This village has 300+ years of history. It is surrounded by mountains from 3 directions and the Great Wall goes from east, south, and west on the top of the mountain. (alt 615 meters). 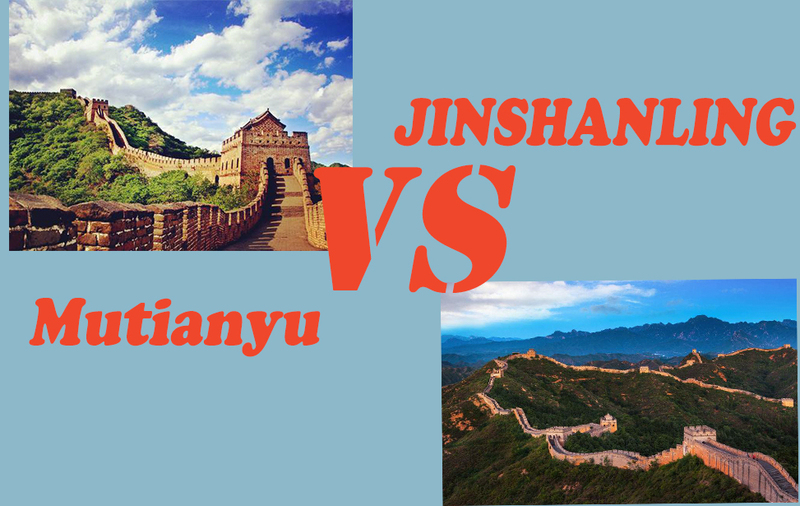 Why you choose Jiankou Great Wall? This wild section is good for people who like adventure and very fit to visit. It is a great place for the photographer and people wand escape the crowd from Beijing. Some of the places are super hard to hike. 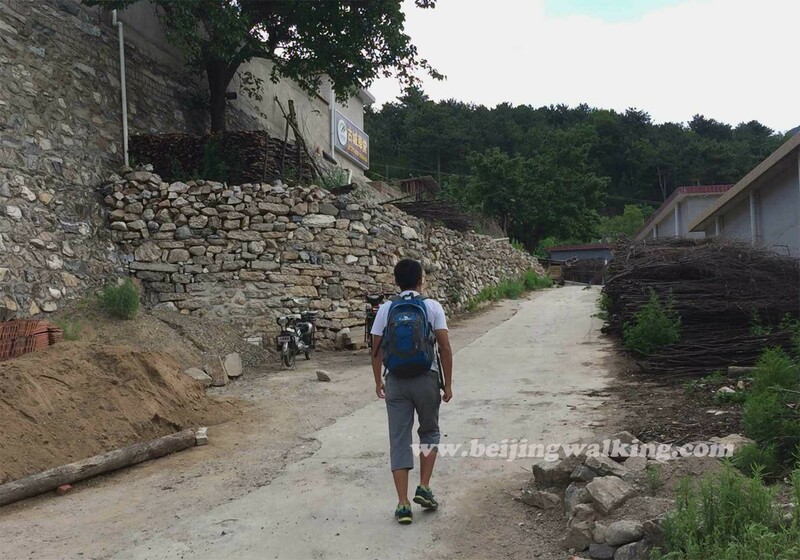 The famous hike route is called Jiankou to Mutianyu. 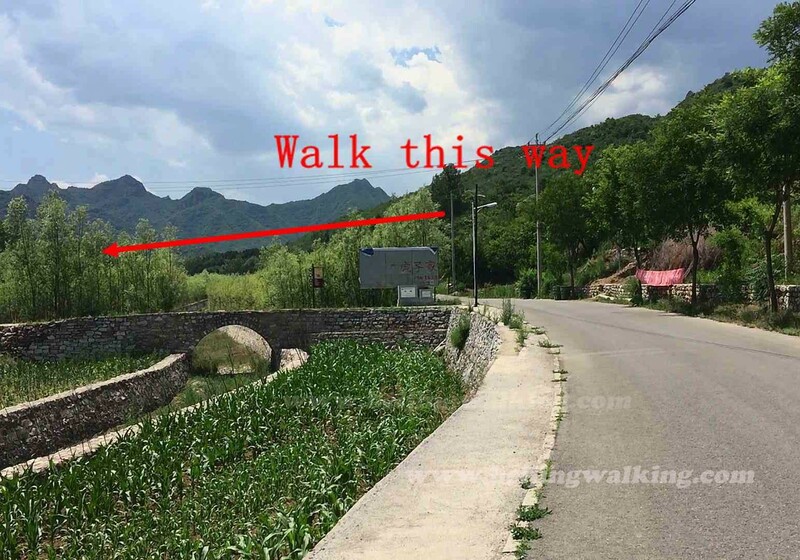 If you start from Beijing Knot （北京结）to Mutianyu （慕田峪）, it is over 17kms hike, with the mountains it equals 30kms walk. If you really plan do a tough hike, you should know this before. 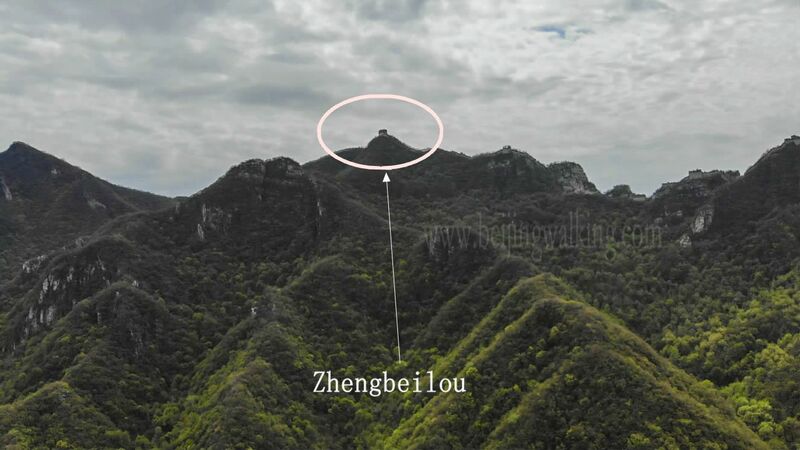 The most classic hiking route is a 4 hours hike from Zhengbeilou (正北楼) to Mutianyu Great Wall （慕田峪）. For this hike, you can enjoy the wild section and also enjoy the rebuilt Mutianyu Great Wall. The hike is doable for most people and can finish in 1 day which is great for people who have limited time. Jiankou to Mutianyu Great Wall hike is a very famous hiking route from which you can enjoy the amazing wild Jiankou view and the rebuilt Mutianyu Great Wall. Even take the toboggan down from Mutianyu. This hike is about 12kmswhichis good for people who like climb Mountains and exercise. 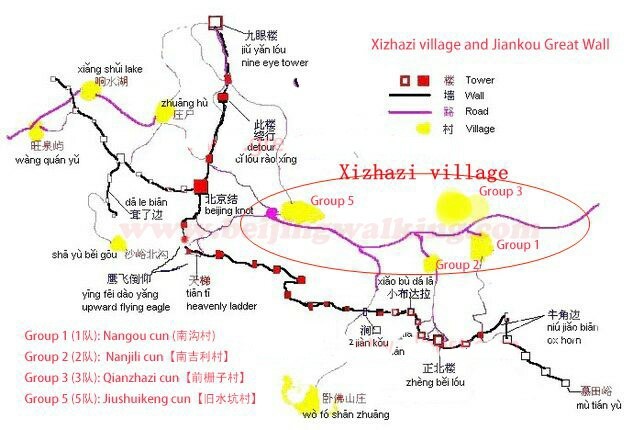 If you want to hike Jiankou, you should get to Xizhazi village 2 DUI or called Nanjili Cun (西栅子村2队, 南吉利). As it is very far away from Beijing in a remote village, it is very hard to get there. It is about 2 hours drive by car from Beijing.【 Book a private transfer to Jiankou or a Jiankou Great Wall hiking tour 】. 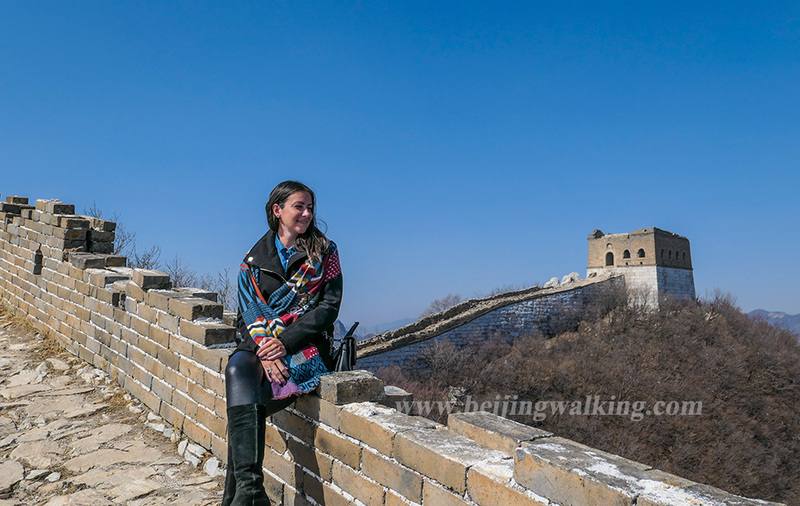 If you want to hike the Great Wall by the public transfer, this is what you are looking for. I hiked the Jiankou by public bus last August, it is not difficult to do it on your own in 1 day. 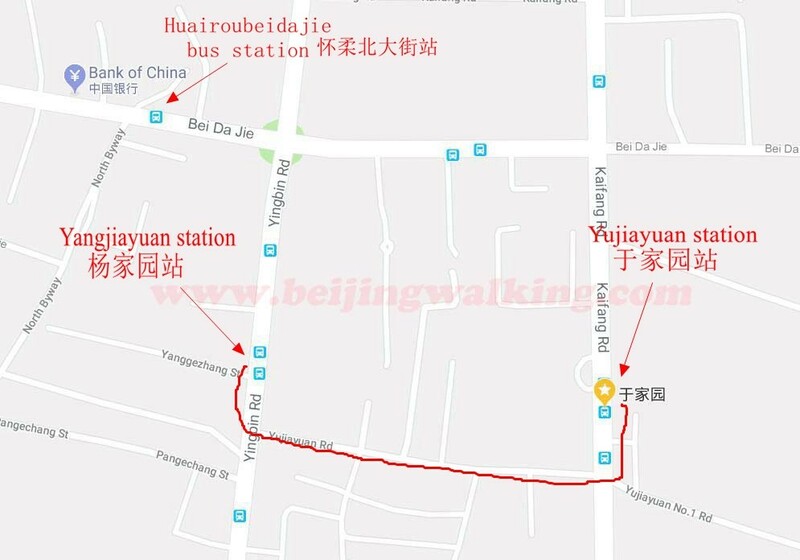 There are only 1 bus H25 can go to Xizhazi village every day which ends at Group 5 from Huairou Yujiayuan bus station. (11:30 am ). Well, this bus schedule 4 pm as well, it is obvious you can only take the bus at 11:30 am to make the hike. So wake up early in the morning and get the bus on time. H25 to Xizhazi village 3dui(西栅子村3队) …8RMB. If you have a Beijing yikatong (metro card 公交卡) ，you can enjoy 50% discount on the transfer which is only 10RMB. From Dongzhimen Bus Hub（东直门公交枢纽） to Yangjiayuan station （杨家园）.I got to Dongzhimen station about 8 am( if you run late, you may miss the bus). There are very clear signs guide you from the subway station to the bus station. 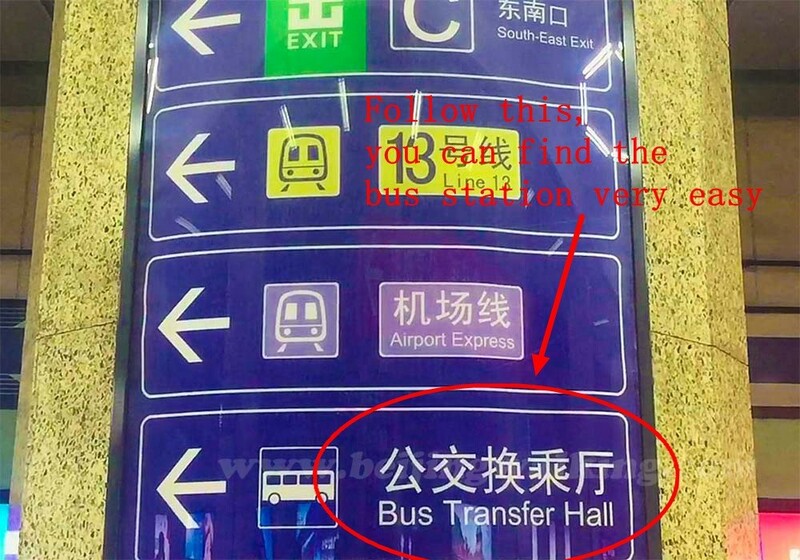 Just follow the signs to Bus Transfer Hall. The 916 Express (916 快)runs every 5 minutes from 5:50 am to 7:50 pm. It takes about 1 hour to get to Yangjiayuan station（杨家园）. 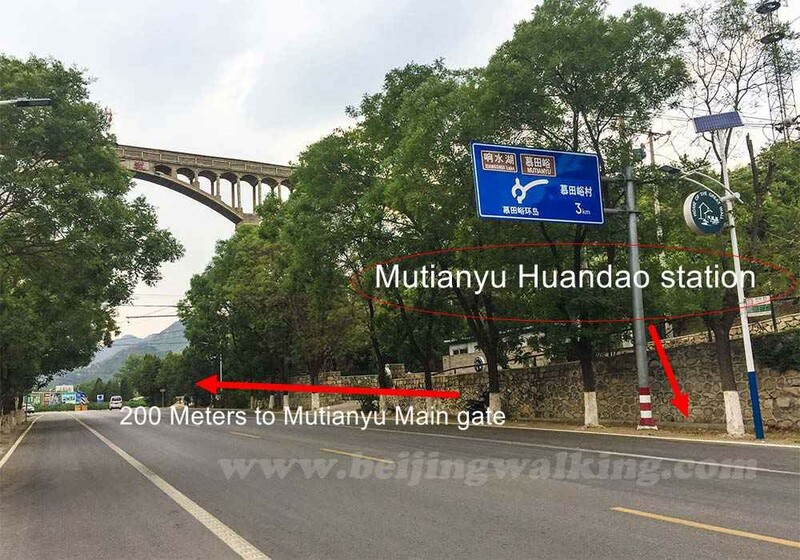 There are a lot of tourists get off from Huairoubeidajie(怀柔北大街)， because they want to visit Mutianyu Great Wall. Yangjiayuan（杨家园） is the next station. After getting off at Yangjiayuan station from 916express. Just walk 10 minutes to get to Yujiayuan station. Follow the map. 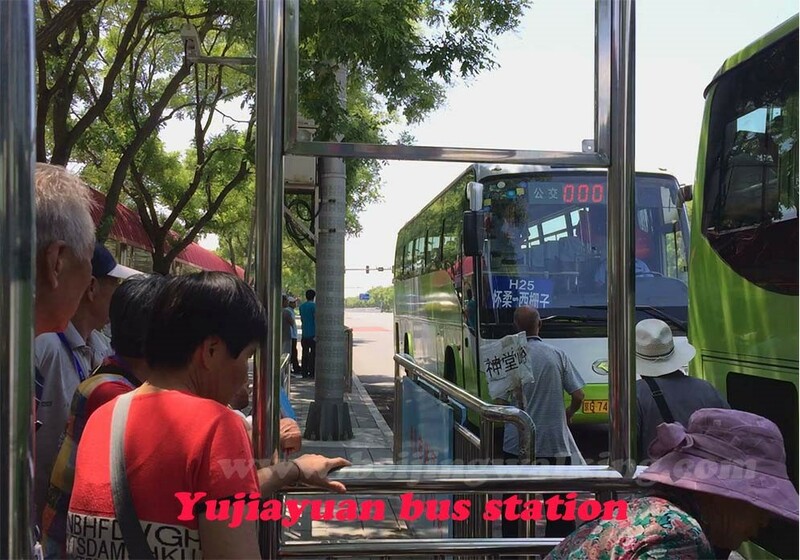 Yujiayuan is a big bus station where you will find a lot of people wait for the bus. The biggest problem for travelers is I didn’t find the station board for H25 in this station. I was a bit nervous. A few drivers come to me offer the private taxi to Xizhazi with 120RMB. I choose to wait, if there is no bus come, I may use the taxi. Fortunately, I waited till 11:30 am, the bus comes very on time. （The station board may be taken away by these taxi drivers, haha, it happens a lot when you travel! The bus was big, clean, AC and not crowded at all. It took me about 1 hour to get to Xizhazi village. When I find the bus get to this wood gate the village is nearby. Tell the bus conductor you want to get off from Group 3 (3队). After get off from Group 3, walk 150meters to get the branch way from the right picture. This is the fastest way to go down. Cable car station is at tower 14. The ticket price is 100RMB per person. It is about 1-hour walk from tower 20 to tower 6. The toboggan is very interesting. There are many paths leading down from the wall. The first 1 you will see is after tower 12. If you don’t clear with the number of the towers. You can find any way on your right side and walk down. It all leading down to the entrance. 8. Take the shuttle bus to the main gate. 9. Find H23 bus back to Huairou Beidajie station, and take 916express back to downtown Beijing. 1. How do I know the right station to get off the bus? One: There is station broadcast on the bus, so you can hear the station. Yangjiayuan station（杨家园）. 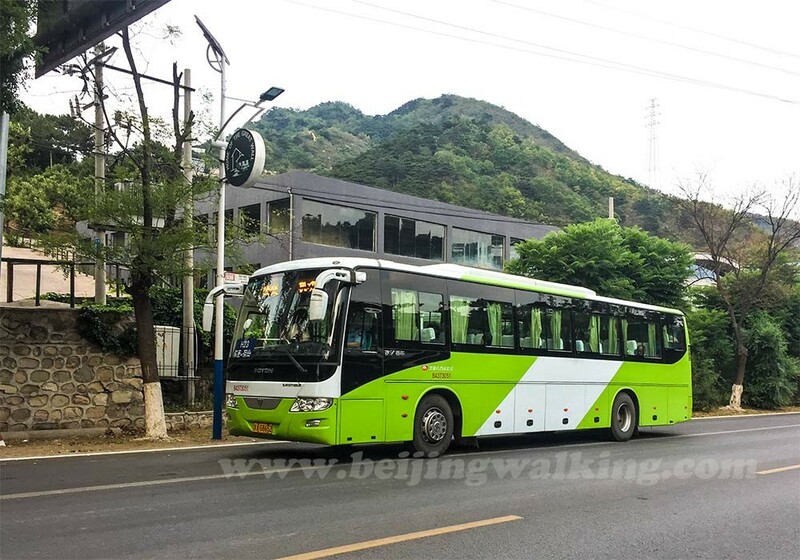 Two: There are a lot of tourists take the same bus to Mutianyu Great Wall. 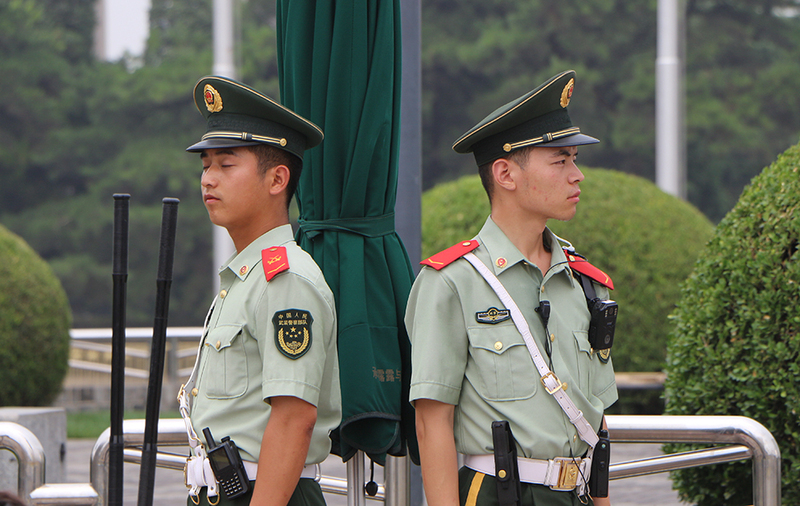 But they will get off from Huairou Beijdajie(怀柔北大街). Yangjiayuan station(杨家园站) is the next station. Three: Show the bus conductor the name in Chinese. He normally will tell you when you arrive the statin. Four: This is the picture of the station. 2. Which station should we get off from H25? If we don’t speak Chinese what should we do? The bus normally takes 1 hour and 15 minutes to get to Xizhazi. Or show them this picture and they understand where you want to go. I was going to at Xizhazi 2 group village on July 18 however there watchman of nature doesn’t allow me to entrance on trek into the wall because he said the trek was closed for heavy rain yesterday. Also, the H25 bus didn’t come at Yujiayuan station until 11:30. And I have been to wait until 12:00 too the bus was nothing to come. I decided to take private taxi that ride to Xizhazi 2 group village. Surprise, watchman told me and the driver that this trek is closed because ground was so much water to run into down. Is true closed? Or no? I thought maybe driver and watchman trick me because they would like to make so much money. I don’t understand at moment on day. The bus, as well as this section of the wall, closed because of the rain. It was super dangerous to climb during the heavy rain. After the rainy season, the bus and the wall will reopen. Hello, we would like to do it the same way you described it. Just read the comment about closing. So does it mean it is still closed right now? We would like to go tomorrow.Thanks for your answer. Your blog is very helpful. Hi, The way to JIankou is blocked by the government. So you can’t drive in that area. I suggest you do Mutianyu Great Wall instead. Hi there, is the way to JIankou still blocked by the government? It is open now! It is hot in this season, take more water with you. Hi ! Thanks so much for your reply ! Ok, I will take some more water thanks ! There are 2 farmer guest houses you can choose to stay. The price is about 150RMB to 200RMB per room. Great! Do you know if I need to book in advance and if so, how I can get in touch with them? The first bus starts at 6 am to huairou. How often does the H23 run in the afternoon/evening toward Huairou Beidajie station? Thanks! 11 am and 4 pm. twice a day. If not it’s 40 kuai. 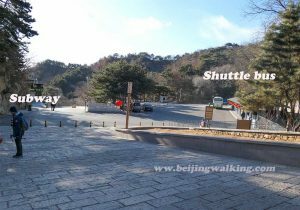 Also, the shuttle bus at mutianyu is 10 kuai to the main gate, if you do walk the way to the main gate, it’s a while away. It was so good! Thank you very very much for this detailed explanation. And you should ignore the man in the bus who tells you that he brings you to the wall by car. Did the walk from Jiankou to Mutianyu today. Leo’s incredibly detailed instructions made it so easy and stress free. I could relax and just enjoy the scenery and experience. Nobody checked for a ticket at tower 20 today (Saturday). I was a little bit surprised at how expensive the toboggan was (100元) but it was a fun end to a great day. Thanks again for the info Leo! I would like to do this hike around the Spring Festival, possibly February fifth. Is this possible? Will public transport still be available during this time, and is the wall itself available for tourists? 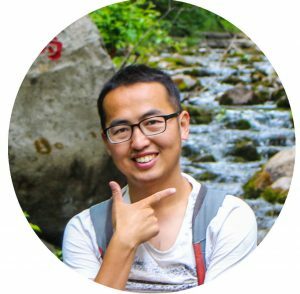 I would like a solitary and road-less-traveled experience of the great wall, are there alternatives? If there is no snow, the bus will still on. the wall is open every day. If you are an experienced hike, it is no problem. You should know that this part of the wall is not rebuilt and there may not have phone signals if you have any trouble you’d better go there with someone. Many thanks for your detailed description of the way by bus and the hiking trail. As we were at 10:15 on H25 bus station we took a taxi to nanling (160 RMB ( the driver started at 180 and We did not negotiate much) so we reached the Zengbeilou tower by 12:30 for a delicious picnic with a magnificent view on the wall… what a day! Fresh temperature (max was -6•C) but super blue sky. NB : no ticket control on tower 23 or 20, though we were Sunday. Good to know you had the great hike! There is no one charge the tickets in this season. Usually, they check it in the busy season and holidays. hello leo! 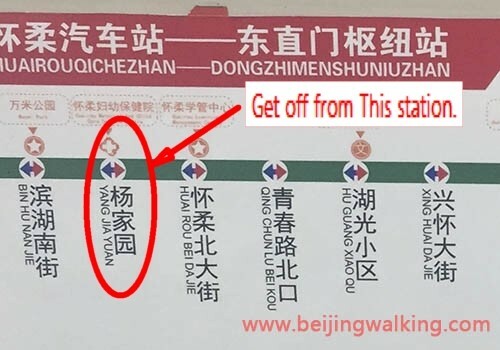 just wanted to ask if you think that it is currently a good time for the hike from zhengbeilou to mutianyu–i just arrived in beijing and would like to go in the next two days, but I am not sure if the route will be blocked this time of year…thanks for being such a great resource! There is no one block it so far. At least all our tours get though. So don’t worry. It is a bit of adventure, be careful. 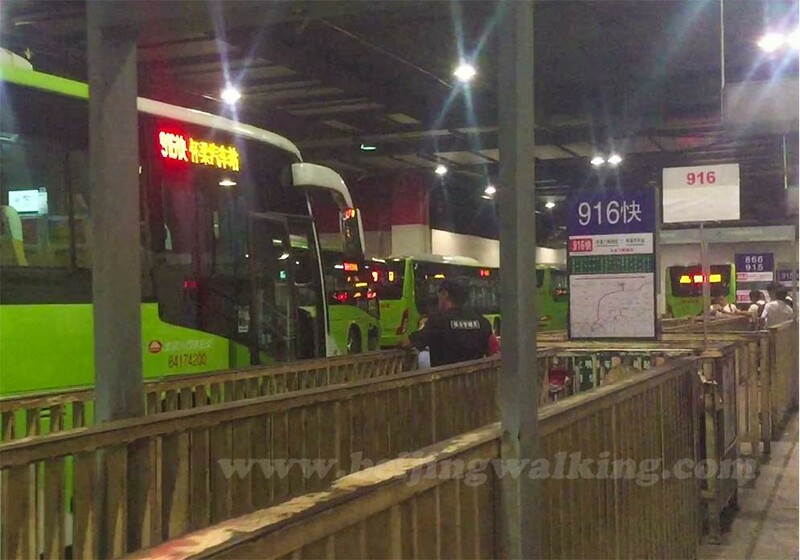 How can we get to the city back from Mutianyu and at what time is the last bus ? Hi, thank you for the thorough information. My husband and I did the hike from Nanjili village with a private transfer from/to Huaibeirou da jie due to the limited buses and the restriction of time. Thank you for a great post. We were able to identify starting point based on your picture above. 3. are there anything we should take note of, we want to see the sunrise, do you think it’s possible? Will there be anything to take note of? 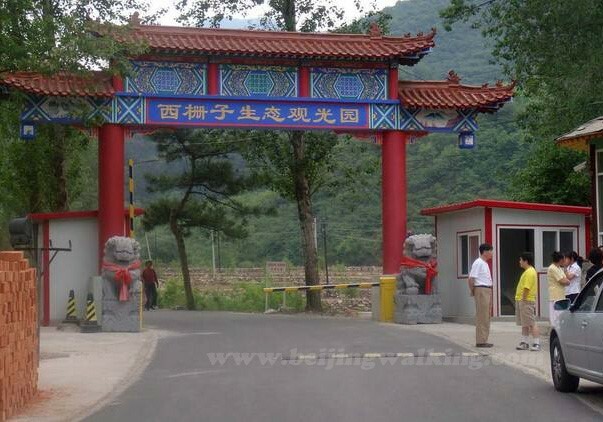 4. if we go from Jiankou and we end up at Mutianyu, do we still have to pay entry fee? The Jiankou is free to go, but it is closed this time as there is a forest fire control. Most taxi drivers don’t know the way to Jiankou as it is far away, it is better to arrange a private transfer. The one-way transfer to Jiankou is around 800 to 1000RMB. See the sunrise is very dangerous, as Jiankou is a wild section, the road up is hard to go.